68 "Good for u Ceiling Cat, u maed thingz bettr for Israel. 69 U pickted up a trumpit for us. 70 Liek teh profetz sed u wud. 71 U protectided us from all teh bulliez. 72 U wuz niec to our daddiz an remembrd dey hadded a deel wif u. 75 n be good all our lievz. 79 dat shienz an liets teh wai." 1 Ceiling Cat iz our hidey place and our strenf, he iz dere for all timez we sez, "hlep!" 4 Dere is river wif streamz that make Ceiling Cat's citee pleased, is holy place where only holyist can sit and lick harblz. 5 Ceiling Cat iz inside her, she is not fall down. Ceiling Cat wakez her up with gentul pawslap to faec. 6 Nationz iz angry, kingdoms fallz, Ceiling Cat meowz loud and Urf turnz to smoosh liek wet fud. 7 CEILING CAT IS WIF US, the Cat of Jakob is our hidey place. 8 Come and seez the wurks of the CEILING CAT, the mightee scratchez he haz maded on the Urf. 9 He makez warz stop to the endz of da Urf; he breakz the claws and shatterz the teef, he burninates the kitty carriers wif fire. 10 "Make quietz, and seez I am Ceiling Cat; I am bestest in ur cuntrees, everyone is want wurship me on Urf." 11 Celing Cat Almightee is wif us; the Cat of Jakob is our hidey place. 15 'e is de imigz ov da invisibl Ceiling Cat, da furst cat ovr dem rest. 16 4 he maded all stufz: stufz in da hoodz ov da Ceiling Cat 'n stufz on dis planit, visibl an' invisibl, if they iz seatz ov base or bossmen or bossmen ov bossmen, he maded dem 4 himselfz! 17 He iz wat iz befor all stufz, and he maik all stufz b. 18 He iz da 'ead ov da body, da churchz! : he is da begining and the furst cat from da zombicatz, so whatevir iz he iz bossman! 20 'n be also da settlimnt-maker ov all playces, even if iz in da hoodz ov da Ceiling Cat or on dis planit, so he go to da X and bleedz. 33 Dey caem to dis plaec called teh Skull (rock!) an crucified Jesus betwin teh criminalz. 34 Jesus sed, "Ceiling Cat, forgiv dem, dey duzint know what dey iz doin." An teh guardz playd diec to desied who got Jesus's clothes. 35 Evribodi maed fun of Jesus. Dey wuz liek "If he is Ceiling Cat's son he shud saev himself." 36 Teh soljrz wuz liek "LOL" an gaev him vinigar to drink. 37 Dey wuz liek "If u iz teh king of teh Jews, saev urself." 38 An dey putted a sien on him dat sed KING OF TEH JEWS LOL. 39 Wun of teh criminalz wuz bein all rude. 40 But teh othr wun wuz liek "Izint u afraid of Ceiling Cat? U gotted teh deth penalti too, remembr. 41 We dizrv it, but Jesus didint do ennithin rong." 42 Den he wuz liem, "Jesus, remembr me when u getz bak to ur kingdm." 43 Jesus wuz liek "Todai u wil be wif me in hevn." Malachai 4: 3: "Stamp on teh bad kittehs pls." Bad Kitty Cat Zed Monster would like everyone to know that despite his bad reputation he does ask forgiveness daily to the Ceiling Cat. Zed Monster lives with other Bad Kitty Cats here. We should all follow Zed Monster's example and ask for repentance. Visit the Bad Kitty Cats Festival of Chaos every weekend. HALP! 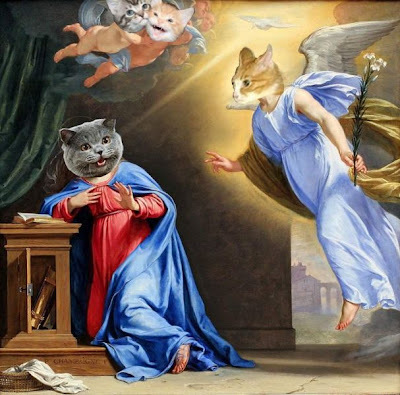 More Holy Cat photos are needed for this weekly post. If your cat is without sin, has a visible halo or any other mark of holiness or worthines, please send me her/his photo as soon as possible. If you would like to help translate the LOLCat Bible, click here. Oh geez, that's too difficult for me I am already proud when I understand ALL words of normal english, lol ! So I will ask my cats but I think they are all athesists ! Zed says thank you... of course, reputation is important. All in Vain eh?